It’s called the “BrightLink Pro,” and though it costs $2100 and up, depending on features, its power awed us. 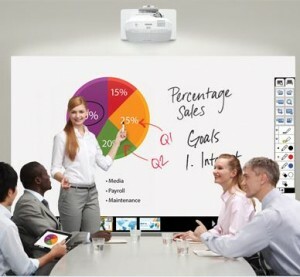 Besides turning your wall into a giant iPad, it can be used as an interactive whiteboard that colleagues can scribble on from 15 remote locations. Whatever they draw or write on the screen shows up on the same page everyone else is looking at. The display is in full color. A small box mounts on the wall. It has lots of ports and all the necessary software already on board. Plug in your computer or a flash drive and run any program it has just by tapping a command on the projected icon. If you run out of space for a presentation, just add a page, up to 50, with all previous pages saved and ready to return to with a click. The BrightLink won a “Gold Stevie” award for the best new business product. Don’t confuse this BrightLink Pro with the one reviewed by PC Magazine in 2013. Same name but new product.